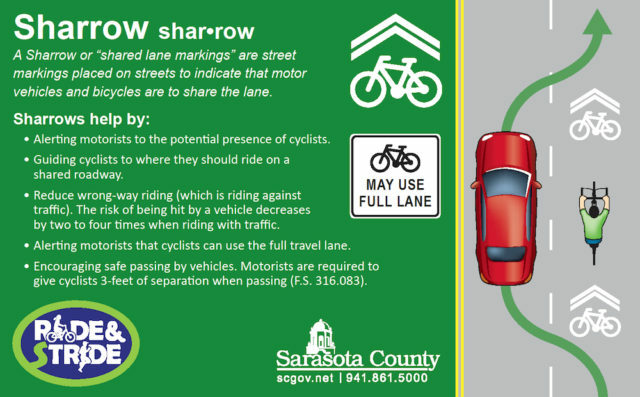 Editor’s note: This article was updated about midday on Feb. 10 to correct information about the use of “sharrows” on Sarasota County roads. 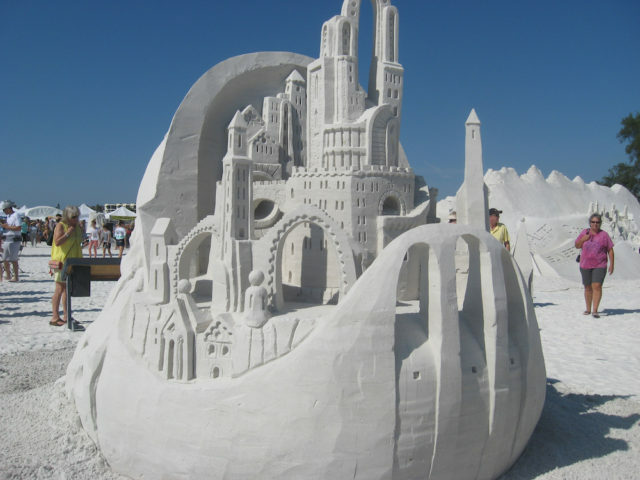 The 2016 Siesta Key Crystal Classic International Sand Sculpting Festival in November 2016 had an economic impact on Sarasota County of $8,134,000, the organizers have announced. The figure was based on data compiled by Research Data Services Inc., a news release says. The Tampa firm has handled such research in the past for Visit Sarasota County. 31% of attendees were “day trippers,” and 28.7% were overnight visitors, totaling 59.7% in out-of-county patronage. Average length of stay was 7.5 nights, with 16,800 room nights generated in area lodging. 37% of attendees came to the Crystal Classic for the first time, which means 63% of the people were returning fans. The production of the 2016 festival was a partnership between the Siesta Key Chamber of Commerce and Mote Marine Laboratory. Founded in 2010, the Crystal Classic “is a collaborative community event that supports the cultural arts and celebrates beautiful Siesta Key Beach,” the release adds. The event was established as the result of discussions between master sand sculptor and Siesta Key resident Brian Wigelsworth and representatives of the Siesta Key Chamber of Commerce, the Greater Sarasota Chamber of Commerce, the Sarasota County Parks, Recreation and Natural Resources Department, Mote Marine Laboratory and Visit Sarasota County. For more information about the Crystal Classic, visit www.SiestaKeyCrystalClassic.com. 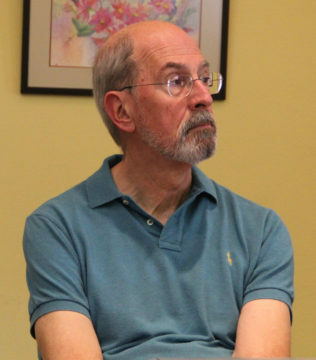 Sarasota County staff is planning to paint “sharrows” on Ocean Boulevard where no bike lane exists, SKA Director Harold Ashby told the approximately 50 people attending the nonprofit’s Feb. 2 meeting. The goal in putting down these images of bikes with directional arrows, he said, is to remind motorists that they have to share the road. “They won’t paint the pavers, but they’ll paint the asphalt,” he added of county crew members, referring to the stretch from Beach Road through Siesta Village to the Treasure Boat Way intersection where no bike lanes are designated. The work probably will be done this summer, he said. 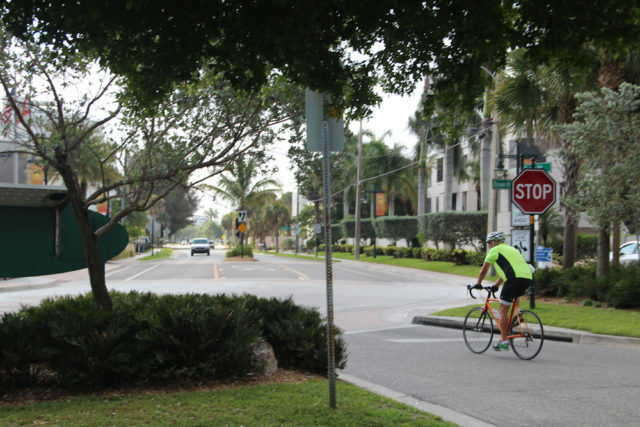 Patrick Lui, coordinator of the county’s Bicycle, Pedestrian and Trails program, told The Sarasota News Leader this week that he plans to coordinate with the Siesta Key Chamber of Commerce and Ashby about the timing of the addition of the sharrows to the road. Obviously, Lui pointed out, it would be better to wait until after season to schedule the project. Asked about the cost, Lui said he estimated it would be between $3,000 and $4,000; the funds will come out of the county’s Capital Improvement Program allocation for the county’s Bicycle and Pedestrian Master Plan. The distance the sharrows will cover is approximately 825 meters, or close to half a mile, Lui added. County staff plans to send a postcard to property owners in the surrounding area before the work gets underway, he noted, to advise them about what will be taking place. Lui also pointed out that the county has put down about 10 lane miles of sharrows since the start of 2016. For more about the county’s Ride & Stride program regarding bicyclists and pedestrians, Lui refers people to the Ride & Stride Facebook page. During the SKA meeting, Ashby also pointed out that although Florida state law allows bicyclists to ride on sidewalks, that is a dangerous practice. During the discussion, an audience member asked Ashby how to resolve a problem on Treasure Boat Way, up to the Higel Avenue intersection. The grass has grown out into the bike lane, the woman explained, “and has never been cut back.” Thus, the bike lane has been narrowed, she told Ashby. “We’ll talk to them about it,” Ashby replied, referring to county staff members. However, Gene Kusekoski suggested that that would be “the perfect thing” for SeeClickFix, a county app that allows people to use their smartphones to take photos of problems and then email them to the county, so the issues can be remedied. “It’s on our website,” Ashby added of the link to SeeClickFix. “These guys are good,” he said. Whenever he has used the system to report a problem, Ashby told the audience, the issue has been resolved quickly. During the SKA’s Jan. 12 meeting, Ashby also commented on the island bicycle maps the organization had printed last year. “They’ve been flying off the shelves,” especially at the public beach, the Siesta Key Chamber of Commerce’s office in Davidson Plaza and grocery stores on the island. The SKA’s next goal, he said then, was to distribute them to the condominium complexes on the Key, so they could be inserted into visitors’ packets and placed among other informational material people could pick up for free in condo offices. He and Kusekoski showed the FDOT representatives some of the problem areas, he said. In fact, as they were walking along, Ashby noted, they passed a bicyclist at one point. When one of the FDOT representatives turned back to watch the cyclist, Ashby continued, “the guy almost fell, hitting one of the obstacles that we had pointed out. They’re convinced there’s a problem,” he added of the FDOT staff members, and they said they would work on a resolution. The SKA also will be partnering with the Out-of-Door Academy on the Key to host a bicycle safety course, Ashby told the audience. Representatives of the school “are very enthusiastic [about it],” he said. He promised to provide more details on that in the future. Further, Ashby continued, representatives of the League of American Bicyclists — an organization based in Washington, D.C., that advocates for cyclists — will be sending its vice president to meet with Ashby and Kusekoski this month to discuss the possibility of Siesta Key’s being designated a Bicycle Friendly Community. Stephen Leatherman of Florida International University is known worldwide as “Dr. Beach” for his annual Top 10 list of beaches in the United States. “It’ll probably take us a couple of years to get through the process of getting recognized [for bicycling],” Ashby pointed out. Finally, Ashby talked about how “bicyclists are their own worst enemy,” creating problems for themselves by not obeying the law. For example, he said, some of them ride the wrong way on the street; the law calls for them to follow the same traffic patterns as motor vehicles do. “We need to talk to the Sheriff’s Office about enforcing the rules here,” Ashby added. That is another matter the SKA can bring up with the Sheriff’s Office, Ashby replied. A second audience member pointed out that many of the culprits are workmen. “They have no other place to park in most cases,” Ashby responded then, noting that residents do not want construction crew members’ vehicles in their yards for fear of oil leaks, for example. 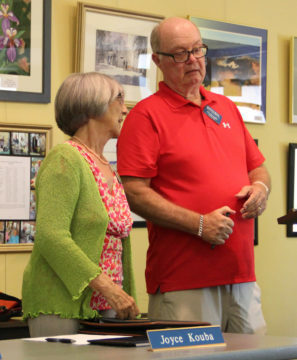 Attendees of the Feb. 2 Siesta Key Association meeting formally met a new director for the organization: Gene Kusekoski. “[He] has actually been working for us the better part of last year,” Director Harold Ashby noted, primarily on initiatives the SKA has begun to make bicyclists safer on the Key. The leadership of the Siesta Key Condominium Council has sent out an email blast, reminding members that the organization will hold its next session at 3:30 p.m. on Tuesday, Feb. 21, at Siesta Key Chapel. The agenda includes an update on Save Our Siesta Sand 2’s efforts to fight the dredging of Big Sarasota Pass, a Sheriff’s Office report, a presentation on the capabilities of Fire Station No. 13 on the island — with related statistics — and an update on the proposed county Comprehensive Plan amendment that could lead to a new hotel on Siesta. The main speaker will be Mike Angers of Brown and Brown Insurance Co., who will talk about flood insurance changes, responsibilities of condominium associations, as well as those of condo owners, and other insurance-related topics. A question-and-answer session will follow. Siesta Chapel is located at 4615 Gleason Ave. on the north end of the Key. Curious residents and visitors alike paused on Siesta Public Beach last week to look at a sailboat that had run aground. Reportedly, the Anthem was headed for St. Petersburg when problems with the navigational system resulted in its taking a much unexpected detour. During the Feb. 2 SKA meeting, Sgt. Jason Mruczek of the Sheriff’s Office fielded a question about it. Representatives of Sea Tow, a Bradenton company, came to the scene that day, he said, to place inflatable material under the vessel to protect it until it could be removed. 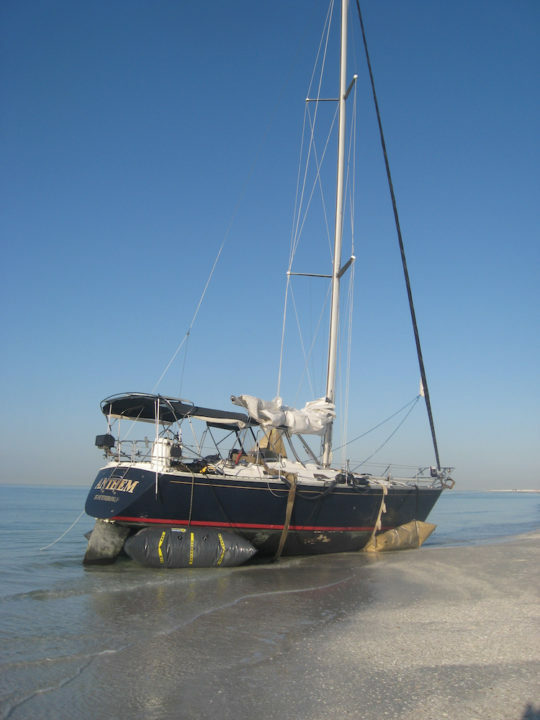 News Leader correspondent Harriet Cuthbert of Siesta Key reported that the towing firm and the owners were awaiting high tide to pull the boat back out into the Gulf of Mexico. 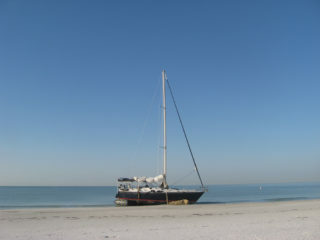 It finally left the beach on Feb. 3, Mruczek told the News Leader. 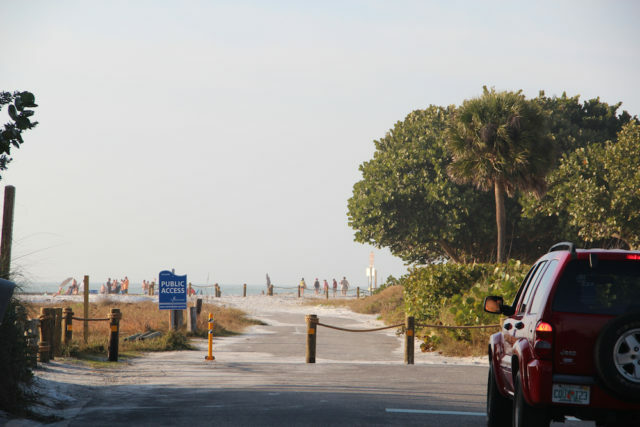 Sarasota County’s chief engineer, Isaac Brownman, confirmed for the News Leader on Feb. 2 that the long-awaited bollards were installed in late January at the southern end of North Beach Road. Dennis and Wendy Madden had been working on the project for months, Dennis Madden told the News Leader in late December 2016. He and his wife were among three sets of property owners on North Beach Road who petitioned last year for the county’s vacation of a 357-foot segment in front of houses they own. The property owners’ attorney, Charles D. Bailey IIII of the Williams Parker firm, promised the commissioners bollards would be erected to prevent vehicular traffic on the stretch of road that has been closed since 1993 because of repeated storm damage. Linda Valley, a supporter of Siesta resident Mike Cosentino — who has fought the County Commission’s May 11, 2016 approval of the road vacation petition on a 4-1 vote — mentioned the bollards during the Jan. 25 County Commission meeting. Brownman added in his note to the News Leader — sent via county spokesman Drew Winchester — that the Maddens obtained a county right of way use permit to erect the structures. The effort was coordinated with the county’s Transportation Department, Brownman noted. She won plenty of laughs from the approximately 50 people at the SKA meeting. On Feb. 2, SKA Director Bob Miller reported that the organization had about 35 more people on its membership rolls that day than it did at the same point in 2016. February and March are the prime months for new members to sign up and for existing members to renew, he pointed out. In March 2016, he continued, the SKA handled about 400 membership transactions.